Are you looking to add an aesthetic water feature to your home? Want to make your front yard stand out from all the rest? 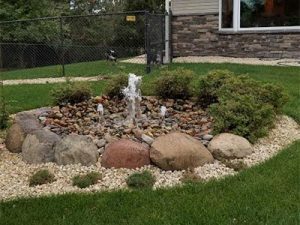 At BDI Outdoor Solutions, Inc. our landscapers frequently install front yard water features in Oak Dale, North St. Paul, Roseville and New Brighton, MN, helping homeowners create beautiful landscapes with uniquely designed water features, from simple fountains to intricately designed aquatic gardens. Waterfalls and Pondless Waterfalls – Whether you want a waterfall that flows into a pond or a pondless waterfall, where the water “disappears,” we’re your landscapers. We design waterfalls that function in whatever way you’d like, including building boulder walls to support a waterfall or incorporating a waterfall into another landscape structure. Ponds – Ponds are relatively simple water features to install, and they require very little effort in design, typically. However, we also build ponds that are incorporated into larger water feature landscape designs! Fountains – Front yard fountains have many options as far as their design goes. You might want a large architectural fountain with interesting stone designs or a smaller fountain that runs off into collection zones, such as a pond. Perhaps you want to incorporate a fountain into an entire aquatic garden design or add a fountain to a garden that’s already on your property – the possibilities are endless! Aquatic Gardens – Aquatic gardens are another water feature that can be as simple or complex as you’d like, built to your specifications with as many or few features as you choose. You can choose the grasses and flowers to include in your aquatic garden as well as how your garden may interact with other water features, including ponds, waterfalls and fountains, so that you have an entire intricate aquatic garden made up of several water features. Deigning your front yard water feature (or features) is simple with BDI Outdoor Solutions, Inc. Our landscapers will help make the landscaping process simpler from start to finish, helping you create a beautifully designed landscape, complete with any water features you’d like. We’ll walk you through all of your options, find the best water features for your yard’s design and for your budget, and build your features to your specifications. To begin working with our Oak Dale, North St. Paul, Roseville and New Brighton, Minnesota water feature landscapers, contact us today at 651-235-7411, or email joemeyer@bdioutdoorsolutions.com. We’ll be there to help you design small, simple water features or large, intricate landscapes, including fountains, ponds, waterfalls and pondless waterfalls, and aquatic gardens. This entry was posted in Landscaping Contractor, Outdoor Contractor, Outdoor Living, Patio Installation MN, Water Features and tagged water feature, water feature designer, water feature installation on June 14, 2017 by Landscaping & Lawn Maintenance.